The Louis Roederer Champagne house has purchased Russian River Valley Pinot Noir specialist Merry Edwards Winery. The deal includes the brand and its inventory, as well as the winery and tasting room in Sebastopol and 79 acres spread over six vineyards. The sale price was not disclosed. The founders of the winery, Merry Edwards and her husband, Ken Coopersmith, will stay on temporarily during the transition period. Edwards is a Sonoma County wine pioneer and one of California’s first female winemakers. Her 28,000-case brand is known for its structured Pinot Noirs, including notable single-vineyard wines. Edwards also makes a small amount of Chardonnay, as well as a barrel-fermented Sauvignon Blanc. Her wines have made numerous appearances in Wine Spectator‘s Top 100 Wines of the Year, including a Top 10 spot for her 2007 Russian River Valley Sauvignon Blanc in 2009. Roederer is no stranger to California. The company founded Roederer Estate in Anderson Valley in 1982, and now owns two other wineries in the region as well: Scharffenberger Cellars, which was purchased from LVMH Cellars in 2004, and Domaine Anderson, established by the family in 2012 with a focus on single-vineyard Pinot Noirs from the region. Rouzaud says they have been looking for a fresh opportunity in other appellations. They considered several other wineries before meeting with Edwards last year. “When Frédéric came to meet me, we spent probably 30 hours together, talking about philosophy and vineyards; it was a very synergistic exchange, and we were simpatico from the beginning,” Edwards told Wine Spectator. 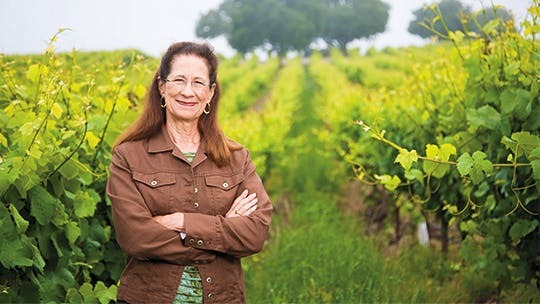 Edwards’ 45-year winemaking career began at Mount Eden Vineyards in the Santa Cruz Mountains AVA in 1974, a year after she graduated from the University of California at Davis with an enology degree. She had a stint at Matanzas Creek, helping winegrowers David and Sandra Steiner build the winery and plant the vineyards, and consulted for many years during the 1980s. She founded Merry Edwards Winery, with a focus on Pinot Noir from Russian River Valley and Sonoma Coast, after purchasing her first piece of land, outside of Sebastopol, in 1996. She planted the first of her six estate vineyards in 1998, and construction of the winery was completed in 2007. She said it was scary to think about changing. “One prospective buyer told me that they didn’t think they could do a good job of maintaining our legacy,” said Edwards. She wanted to find a suitor that respected her employees and wouldn’t tear the staff apart. “[Roederer doesn’t] want to disrupt the success we’ve achieved,” she said. Champagne Louis Roederer was founded as Dubois Père & Fils in 1776, and was renamed in 1833 when Louis Roederer inherited the company from his uncle. It is one of the largest independent Champagne houses, making approximately 300,000 cases annually, and is known for elegant and ageworthy wines, most notably its prestige cuvée, Cristal, which is one of the most sought-after cuvées on the market. Merry Edwards’ Pinot Noirs and Sauvignon Blancs are among the Russian River Valley’s best. The Rouzaud family has continued the Roederer legacy since 1979, when Jean-Claude Rouzaud replaced his grandmother, Madame Camille Olry-Roederer, as president. Jean-Claude’s oldest son, Frédéric, was appointed president in 2006, and is the seventh generation to carry on the heritage. That family legacy intrigued Edwards. “They understand the dynamic of family life, and they understand the essence of our business being woman-owned because of their history, and I know they will nurture that unique character,” she said. Edwards said Rouzaud and his team also fell in love with her vineyards. “Merry’s precise and rigorous attention to details can be seen in the vineyard,” said Rouzaud. The Rouzauds have always been ambitious and tenacious, but calculated in their acquisitions. “We are not a financial group. We are family shareholders,” said Rouzaud, noting that they didn’t need another winery to manage, but concluded it was an ideal and exciting fit to their portfolio. The family began seeking opportunities outside of Champagne in the 1990s, purchasing wineries in California, Bordeaux, the Rhône Valley, Provence and Portugal. There are no immediate plans for changes at the winery. Rouzaud says that part of Roederer’s philosophy is to let wineries be themselves, and he hopes they can learn from Merry Edwards’ approach to visitors and mailing-list customers. He believes that part of their challenge in the next 10 to 20 years will be connecting with their consumers—nearly all of the wineries owned by Roederer are closed to the public. Edwards said she isn’t plotting her next move, and is happy to have more time for personal endeavors. “I want to leave the future open,” said Edwards. While she plans to stay on for at least a year during the transition, she doesn’t know how things will unfold for her and what she might be interested in taking on at the winery, or elsewhere.